You would be excused for thinking this was written in response to this years amazing visual effects bake-offs hosted by the Academy in which the 10 selected films wowed the audience with the most spectacular effects exhibited to date--all of which demonstrated near technical perfection. Rather, this quote is from The Handbook of Motion Picture Photography by Herbert C. McKay A.R.P.S.,published in 1927. The Handbook of Motion Picture Photography by Herbert C. McKay A.R.P.S. 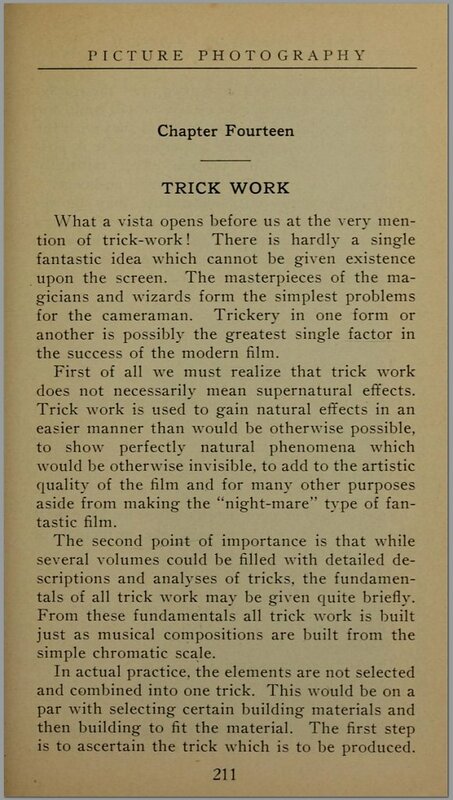 Much has changed since 1927, but trick work, in one form or another, is still “possibly the greatest single factor in the success of modern film.” Of the 10 highest grossing movies of all time, all of them heavily feature visual effects. If you prefer to adjust for inflation, the list tops with 1939’s Gone With the Wind, full of innovative matte shots and other trickery. Second place? Star Wars, decidedly the most iconic visual effects film of all time. This, then, is our motto and our challenge. Since we can create anything, what then should we create? This is the first year where I heard numerous people say they’ve seen enough Manhattan skyline destructions. The quintessential shots from 1998’s Armageddon have been re-created and bested enough times to actually tire the audience. What impresses today? To me it’s a film like Gravity that seamlessly integrates on-set camera work and lighting with well-planned and choreographed acting to create an immersive environment that truly tricks the audience into believing the film was shot in space. The kind of collaboration between camera and computer graphics that can only come about when the two teams are integrated in new and surprising ways. Impressive? It’s last years Academy Award winning Life of Pi whose computer-generated tiger performance was believable enough that people actually questioned whether the tiger Richard Parker had been starved for the filming of the movie. A few things have changed since 1927. When matte paintings were completed on set, and photographed through glass, the time-consuming artistry and attention to perfection were on display for the entire crew to see. In the articles of the day, the celebrated visual effects “magicians” were the painters whose brush detailed the landscapes and fantastical structures for the film. Today, by contrast, the work takes place in darkened buildings around the world, months away from the on-set photography. The work is so complicated and overwhelming, it tends to be simplified to highlight the number of visual effects shots, computing power and technical innovation over the design, painting and hard earned detail that we see on screen. Yet, more hours of digital painting go into any modern film the any film of the earlier days of visual trickery. Can you name 5 painters working in visual effects today? It’s easy to become enamoured with the recent technological innovations: the freedom of movement allowed by the camera in even the most complicated shots, the apparent ease that large numbers of effects shots can be completed at late stages of a movie production, the detail and realism of computer graphics in film and more. Shots that are not carefully conceived on set can often be saved in post-production with combinations of digital techniques. All reasons to celebrate. But, just like the legendary Jack R. Cosgrove and painter Jack Shaw, today’s movies are “painted” by talented artists around the world. The technology that we’ve created helps speed up a few of the most time-consuming steps, but the design, the movement, the hard painstaking work of painting, animating and lighting every component of the scene to look believable is the same as it has always been. At Sony Imageworks we've been doing some things to help this process along. We've designed a language for describing how light interacts with objects and we give it away to the community for free as an open source project call Open Shading Language. You’ve seen Open Shading Language in movies like The Amazing Spider-Man and Cloudy with a Chance of Meatballs 2. It’s a small but rich language designed for advanced renderers. By sharing it with the community, we hope to see greater ability to share techniques between various renderers and allow talented shader writers (who need both an extensive technical background and strong artistic skills) to spend more time on improving the look of materials and less time worrying about the technical details. At the Visual Effects Society Technology Committee we just released and standardized VFX Camera Report form in digital and PDF format. What problem does this solve? Today, the information captured on set in terms of lens and camera information--required for most visual effects work--is error prone and sometimes even lost before it can make it to the post-production process. In the absence of this data, the choice of lens and other camera information in the shot must be guessed by visual effects artists. This process is time-consuming and error prone--and does not always replicate the intention of the Director of Photography on set. By using this freely available standardized camera report, our hope is this information can be passed from set to visual effects quickly and easily, reducing error, increasing quality and allowing more time to be spent on the artistic elements that should be the focus of the post-production process.